A Collaborative Initiative by the C.E.U. 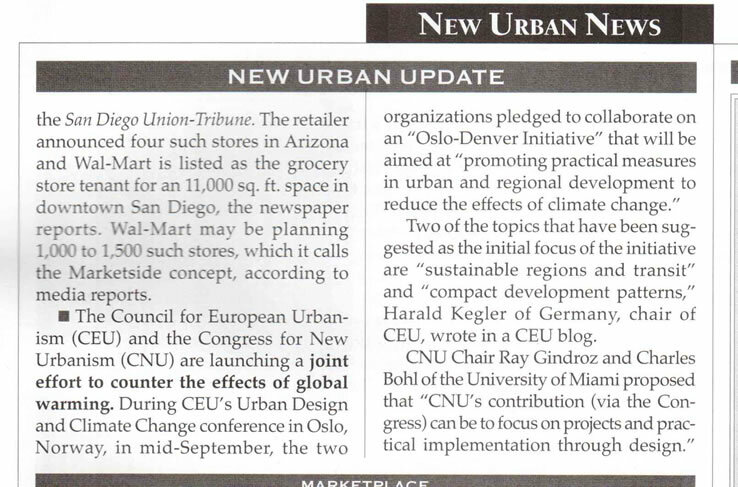 and the CNU The “Oslo-Denver-Initiative” (ODI) is a joint initiative of C.E.U. and CNU that is aimed at promoting practical measures in urban and regional development to reduce the effects of climate change. On the occasion of the International Congress of the C.E.U. 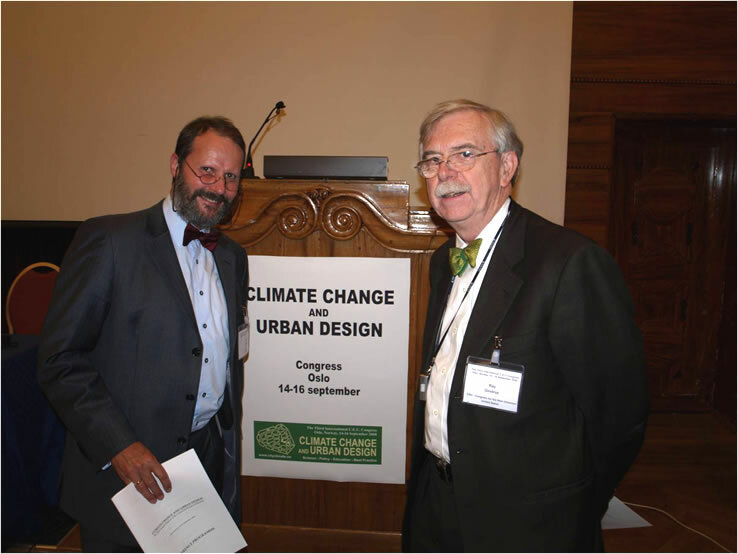 “Urban Design and Climate Change” to be held in Oslo in September, 2008, the Council for European Urbanism (C.E.U.) and the Congress of the New Urbanism (CNU) are starting a joint initiative in transatlantic co-operation to promote practical measures in urban and regional development to counteract climate change. The foundational process for this initiative will be completed at the CNU Congress to be held in Denver in June, 2009. We believe that Europeans and Americans have a special responsibility with regard to climate change and should be the first to concentrate their efforts on undertaking effective steps in the field of urban and regional development against climate change. Nonetheless, this initiative is open to all interested parties and is not restricted to European / United States partners. A double strategy is contemplated: the reduction of existing man-made climatic effects in urban regions, and the prevention of further climate change by urban regional planning and control. The sponsors are aware that Europe and the United States are important industrial regions that contribute in significant ways to climate change. On the other hand, both Europe and the United States have already initiated a long list of measures to combat climate change. The consequences of climate change also have a large impact on cities and regions that are? only minimally responsible for man-made climate change. That is why these regions are invited to take part in this initiative. Truly effective steps can only be initiated in a world-wide dialogue. Around the world there are many initiatives dealing with climate change, but only a few of them deal explicitly with this subject from the point of view of urban and regional development. Global climate change, with its social, economic, cultural and ecological dimensions, is one of the principal challenges facing humanity in the 21 century. As the majority of people live in cities, st urbanized and suburbanized regions, which tend to increase climate change by generating carbon dioxide, and are thus located in climactic "danger zones," it is crucial that cities and regions be on the front line of climate protection and the prevention of further damage. Many attempts have already been made in this direction. However, we are still at the beginning. There is still a great deficiency in the areas of urban design, urban and regional planning and the control of urban and regional development. As for the energetic reorganization of city regions, the creation of compact, de-centralized housing spaces, the complex economical handling of resources or the minimization of auto-dependency - all these approaches are practical requirements in future urban development. The Oslo-Denver-Initiative will identify New Urbanist and European Urbanism tools, techniques, and models as a response to the dual challenges of Climate Change and Fuel Supply It is formed in the spirit of the initiative for a “Sustainable Development” that was started 20 years ago in Oslo with the “Brundtland Report”. Much effort is being spent on finding alternative technical solutions to these challenges, but our focus will be on urbanism. Our goal is to find ways of creating beautiful, sustainable neighbourhoods, cities, and regions, that not only reduce energy use and climate impact, but also enhance the quality of life. Each side of the Atlantic brings different experiences, traditions, and problems. Through a creative exchange of analyses, techniques, concepts, tools, and models, we hope to develop new solutions. 5. To Initiate and Support concrete projects and measures with model character. 1. Sustainable Regions and Transit: The traditional forms of regions with a collection of compact settlements, mixed use development patterns, linked by transit, connected to other regions by long distance rail, and set in an agricultural hinterland for local food productions provide a useful model to be tested. In some areas, the essential elements have been underused or even abandoned. In others, they do not exist or are just being created. The goal would be to identify the essential attributes, identify obstacles to their full use, and providing examples of successful models. Examples would include traditional ones that are successful, existing ones with problems, and new ones. 2. Compact Development Patterns: Housing and neighborhood patterns in the US are less dense than in Europe. Even the recent return to urban living has only slightly diminished the emphasis on suburban sprawl. Liveable compact development models need to be developed for family living as well as the types currently found in city centers. International collaborations among New Urbanists and the European Urbanism has provided new ideas and models. The goal would be to identify models, define their attributes, and their contribution to reduction carbon production and climate impact. NEXT STEPS: In the period between September 2008 and June 2009 all interested parties are invited to participate in the formation and organization of this initiative. We recommend establishing a small working task force on both sides of the Atlantic. During this time, C.E.U. and CNU will establish the preconditions for working effectively and facilitating the effectiveness of “ODI”.